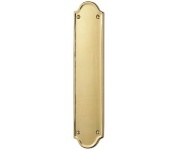 Solid cast brass Victorian finger plates, plate size: 300 x 70mm, plate thickness 6mm. Flat brass finger plate, in 1.5mm gauge solid sheet brass. Plate size: 305 x 76mm. 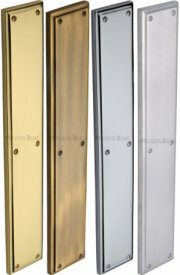 Available in Polished Brass, Antique Brass, Satin Brass, Polished Chrome, Satin Chrome, Satin Nickel, Polished Nickel & Matt Bronze. Solid brass, quality die-cast, Georgian finger plate. 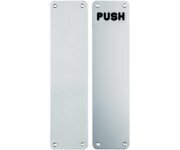 Push plate size 305mm x 73mm, plate thickness: 7.3mm. 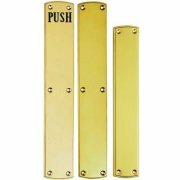 Shaped solid brass finger plate. Size 305mm x 64mm, plate thickness 10mm. 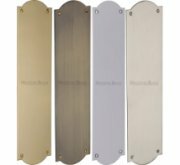 Stainless steel finger plate, available in 300mm, 350mm, 475mm, 500mm and 650mm x 75mm sizes in a plain or engraved push plate. 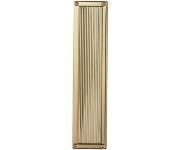 Large solid cast brass finger plate with a stepped edge. 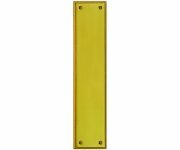 Available in 382mm x 65mm with 4 fixing screws or 457mm x 76mm with 6 fixing screws. 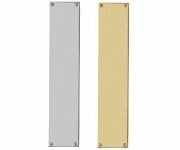 Slim solid cast brass finger plate. Size 282mm x 64mm. 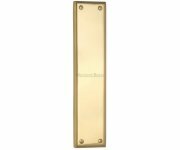 Heavy solid cast brass finger plate. Size 460mm x 76mm. 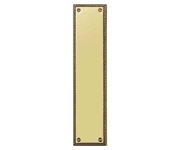 Flat shaped brass finger plate. Size 305mm x 75mm. 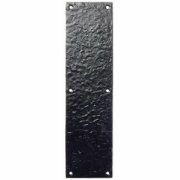 Ludlow Foundries black iron antique finish finger plate 315mm x 67mm. 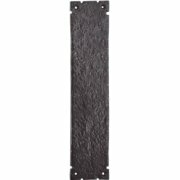 Foxcote Foundries black iron antique finish finger plate 292mm x 76mm. 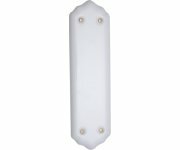 Staffordshire white porcelain finger plate, size 280 x 77mm, to match Staffordshire porcelain door knobs. 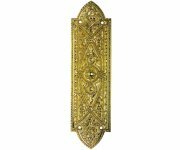 Regency style solid cast brass beaded finger plate. Size 305mm x 70mm, plate thickness 6mm. 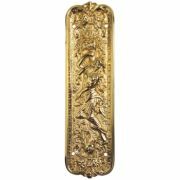 Solid brass Art Nouveau finger plate. Size 260mm x 76mm.